Free password manager tool to manage all your passwords in an encrypted database. Your entire digital life is stored behind passwords. Keeping these passwords safe and unique has never been more important. Yet at the same time these passwords need to be easily accessible and never forgotten. A very simple solution is using a password manager software. 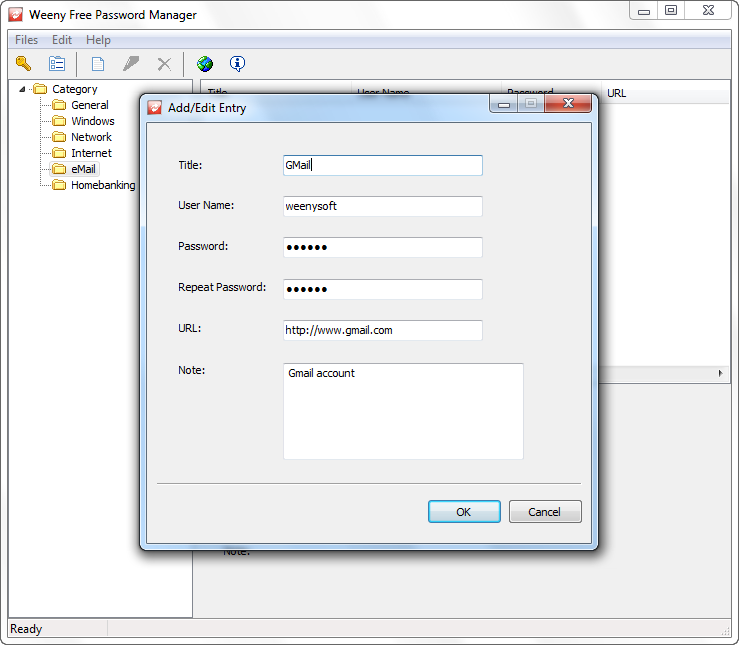 Free Password Manager is such a free password manager tool to manage all your passwords in an encrypted database. You can put all your passwords in one database, which is locked with one master key or a key file. So you only have to remember one single master password or select the key file to unlock the whole database. The databases are encrypted using secure asymmetric cryptographic algorithm. The secure asymmetric cryptographic algorithm includes: 3DES, Blowfish, Cast128, DES, Ice, Ice2, RC2, RC4, Rijndael, Serpent, Tea, Thin Ice and Twofish. Apart from passwords, Free Password Manager also stores website URL, login name or other customized information. When double clicking an entry in Weeny Free Password Manager, it will open the website URL, automatically type the login information and login. 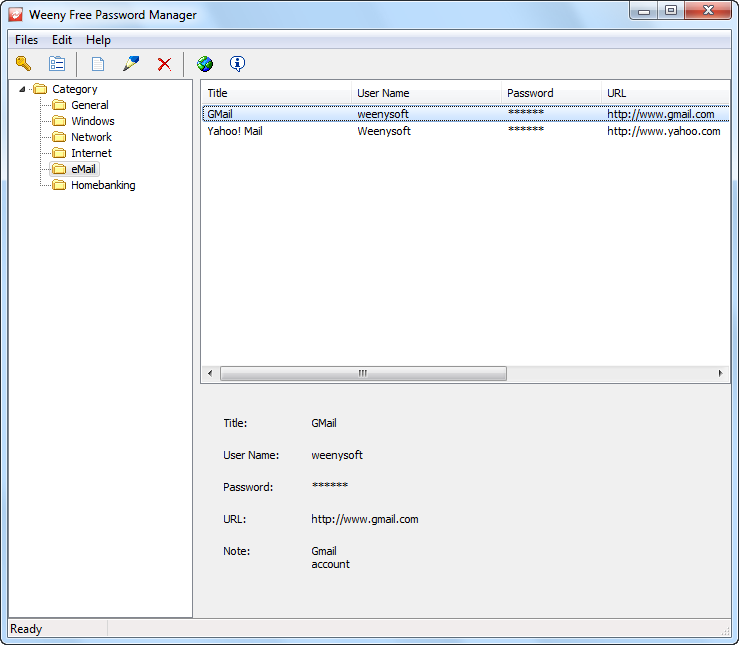 Free Password Manager works on Windows XP, Windows Vista, Windows 7 and Windows 10, both 32-bit and 64-bit versions. 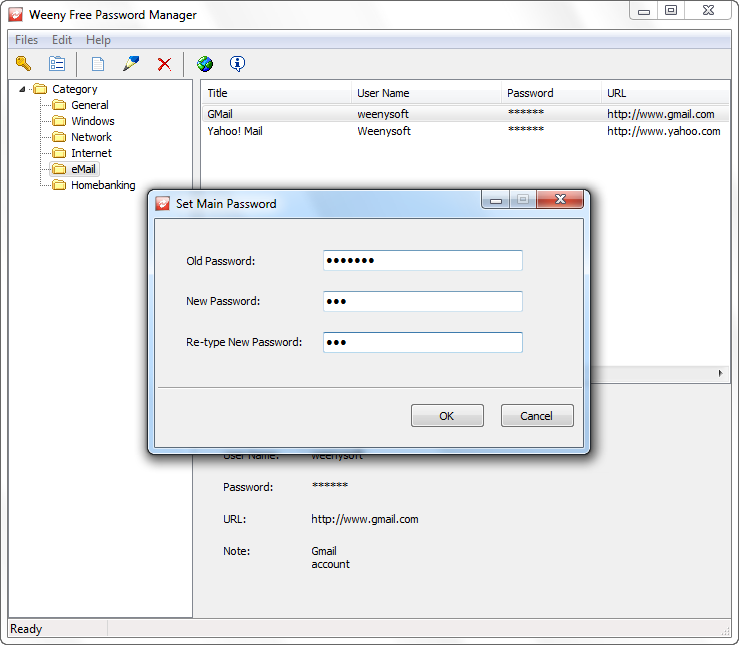 Free Password Manager is released under the terms of the GNU General Public License, Version 2 (GPL version 2). Click the download button above to download Free Password Manager full version. Full version means the file is complete and comes with all the media needed to install and manage this software. Full version also means Free Password Manager software doesn't have any watermark, nag screen, time expiration or function limitations. Easy to use - A few clicks to manage your passwords. Secure database - Encrypted using secure asymmetric cryptographic algorithm. Master Password - You only need to remember one master password.